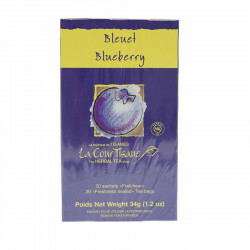 Box of 20 tea bags of blueberry herbal tea. 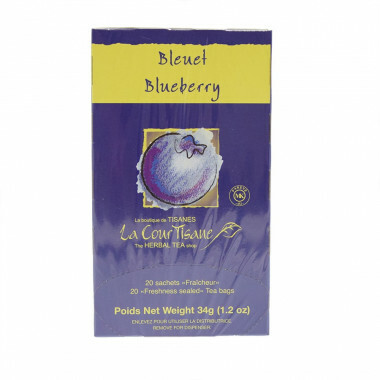 This La CourTisane box contains 20 individually wrapped tea bags with blueberry flavour. This herbal tea can tasted hot or iced. To make an iced herbal tea, pour 1/3 of a cup of boiling water, steep one tea bag for 3 to 5 minutes. Remove it and fill with ice cubes then stir and enjoy! The Four O'Clock teas are made in the Trans-Herbe factory. This company also makes the Courtisane that offers a large range of flavours. These teas are made with quality ingredients with mutiples flavours: blueberry, orange caprice, mango, wild berries, passion fruit, ginger pear, spicy chocolates, lime and cranberry. Ingredients: rosehips, hibiscus flowers, blueberry leaves, lemongrass herb, orange leaves, orange peels, natural flavours, lemon peels, blueberries.